We are sorry to hear that your experience was not a positive one for you. Our records show that your order was cancelled per your request. 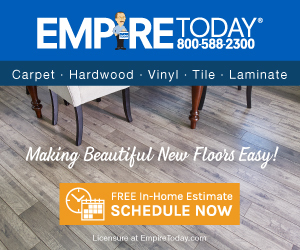 For future concerns please contact customersupport@empiretoday.com. Tried to get a new tile floor for my bathroom. Sales rep lied, said the floor would be installed Friday morning, 9 am. No one showed. At 7 pm the work was rescheduled for Saturday at 8 am. The installers finally showed at 2:30. They demanded full payment up front before beginning work. This is a violation of the NJ Consumer Affairs act. After ripping out my old floor, the installers said they could not complete the job because I needed to get additional work done by a carpenter. I called Empire. They are holding my money for 15 days. It seems that the only way they could return my money was to deposit the checks. But, Empire's accounting office only writes checks 2 days a week. So, I have to wait on Empire again. So much of my time wasted. And now I have no floor at all in my bathroom. I didn't like: Misleading sales, Lack of integrity, Mistake by rep, Dishonesty, Time it takes to get my money back. Review #894074 is a subjective opinion of kallcroft. We have sense your frustration and regret that your installation was not completed as planned. We understand that we have been in contact with you regarding this matter and will continue to follow up until a solution is reached.